For the eighth consecutive year, my artworks are on display, along with hundreds of other amazing paintings, sculptures and craftspieces from dozens of Capital Region artists, as part of Historic Albany Foundation’s “BUILT: Architecture Through Artists’ Eyes” event. I’m all set. I’ve got my suit on, my six stickpins from my first six BUILT appearances are on my suit coat lapel, and now I just need to call a cab. I’m cabbing to BUILT this year, only because with my cataract surgery a month away, I did not want to chance driving at night from the event. Called Troy Black and White Cab. Called A-1-2 Taxi in Watervliet. Well, I’m in Green Island, which is NOT Troy, but that’s on you. Called a third cab company. Went to voicemail. Voicemail? For a cab company? Called a fourth cab company. Number disconnected. Called a fifth cab company. They gave me the number of the FIRST cab company. All right, Albany’s taxi services … I gave you FIVE chances on a Saturday to make some money. Wait the two hours for Troy Black and White Cab to pick me up, which would make me late for the event – and then I couldn’t guarantee they’d be able to take me home afterward. Drive there, and drive back and HOPE that I don’t cause an accident at night. And in the end, I chose Option D.
Option D was – and trust me, I held out for as LONG as I possibly could – I installed Uber on my BlackBerry and summoned a ride share. Hey, Capital District cab companies, I stuck with you when everybody else abandoned you for ride sharing services … now, when I need you, you’ve crapped out on me. I guess dedication only works one way, amirite? Fifteen minutes and an electronic payment later, I was at the Empire State Plaza Museum for BUILT 2018. My pieces were on display, and they received plenty of attention and looks. There’s Ladies Make Their Own Entrances, right over here. Damn, I remember when I took that photo with my model friend Muse. It was colder than a pawnbroker’s heart on the corner of North Lake and Washington Avenues. But the photo shoot worked out. 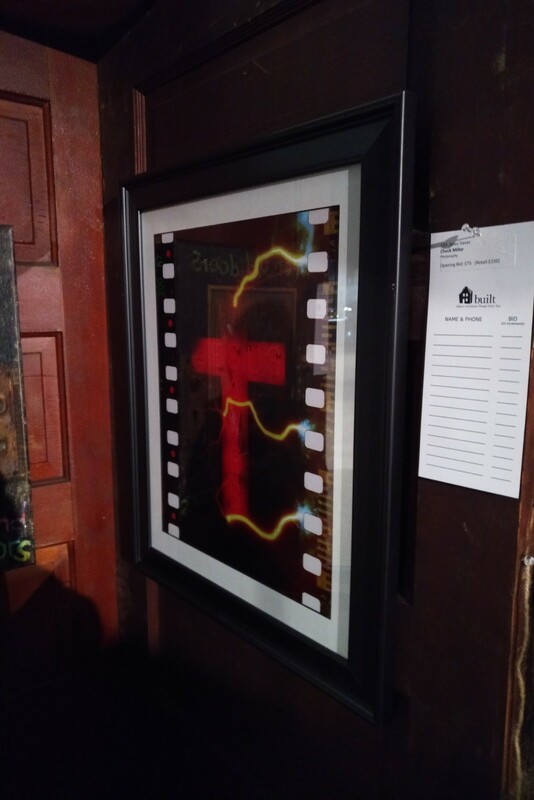 Around the corner – there’s Jesus Saves, my Revolog Tesla 2 film-packed photo of the neon sign in Albany’s South End. I remember when I took that photo. Yep, my old Nikon F100, my manual telephoto lens that was so heavy it doubled as a bicep barbell, and 2:00 a.m. in the South End, when the only things awake were the cops in the patrol cruiser and the two perps in the back of the patrol cruiser. And finally, my Fort Orange Dairy and Feeds burlap art project. Dang, it looks good mounted and framed, doesn’t it? During the night, I actually ran into two of my blogroll bloggers, which was nice. Silvia Lilly, whose DelSo blog is definitely worth checking out, was at the event and she was having fun. I should note that years ago, she gifted me a salvaged twelve-pane window and challenged me to create something with it – that next year, at BUILT, that window turned into a Madison Theater-themed Dream Window, which sold quite well at the event. I also ran into the creative force behind the very excellent “98 Acres in Albany” history blog, a blog about the twelve city blocks of downtown Albany that were destroyed to build the Empire State Plaza. How ironic is it that BUILT is hosting its event in a facility where some of those city blocks once existed. I also struck up a conversation with the Moore family, whose father Dean Moore brought his oil paintings to BUILT for several years. The Moore family offers the Dean Moore award at BUILT to artists that also encompass Dean Moore’s enthusiasm and spirit and technique. 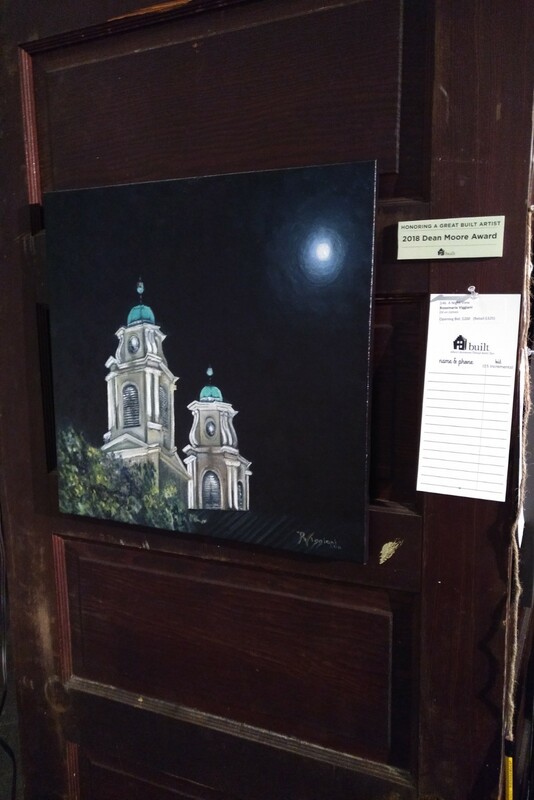 The picture that won said award was an amazing moonlight oil painting of the spires from the First Church In Albany (Reformed) on North Pearl Street. Damn I wish I painted that. Of course, during the night, I’m trying to not hover around my pictures, I don’t want to scare people away by being the artist’s equivalent of a “helicopter parent” – but eventually, one by one, I start seeing bids on my pieces. Fort Orange Dairy and Feeds got the first bid of the three. Then a second bid. Ladies Make Their Own entrances picked up a bid. Sweet. One of the Moore daughters, who I spoke with earlier, was the high bidder on Ladies Make Their Own Entrances, and she explained to me why this picture spoke so strongly to her – and actually opened my eyes to a new interpretation of the image that I had not previously considered. Then I noticed something. The bid on Fort Orange Dairy and Feeds was an underbid. In silent auction parlance, the artist starts an item with an opening bid request, and the first person to write a bid on the bidding sheet puts down that minimum bid as their first bid. But if they write down a bid that’s less than the minimum bid, the artist has the right to refuse the sale – or the charity has the right to refuse the bid. This happened a few years ago with my Dream Window at the TRASK in Saratoga Springs – someone wrote an underbid on the sheet, it didn’t reach the minimum threshold, and the Saratoga Springs Historical Society refused the sale. Bummers. 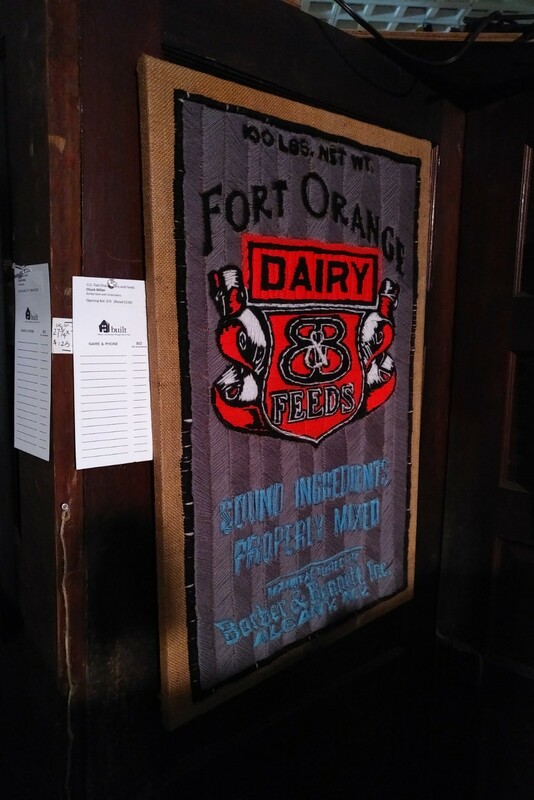 Another person put a bid on Fort Orange Dairy and Feeds. Higher than the first bid, but still an underbid as well. I have to consider my options. Do I let the artwork go for less than the minimum? Do I go find the bidder and tell him or her to up their bid? Do I say nothing and let all this play out? It’s possible that the bidders had problems reading the bid sheets, the lighting in the Museum had the equivalent candlepower of a lantern in a coal mine. In the end, the question became moot. A third person walked up to Fort Orange Dairy and Feeds, and outbid the previous two parties – and that person wrote down the minimum bid. Photo claimed, all is well. 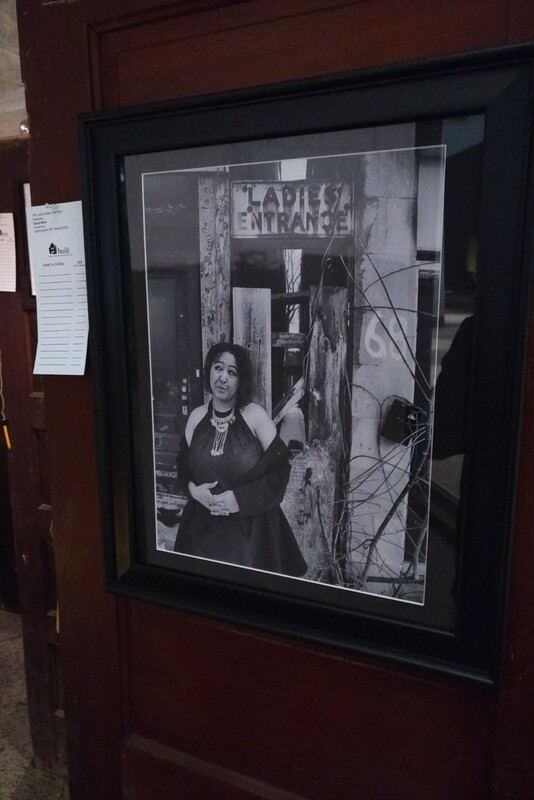 In the end, all three artworks sold, money was raised for Historic Albany Foundation’s preservation efforts, and my “Charity Season” efforts are off and running once again. Now it’s time to work on BUILT 2019. Oh yeah, and I have to call a cab to get home. Wait – no – try this Uber thing again. What a wonderful outcome! Congrats to you, the patrons who won and the Foundation for a successful night! I so enjoyed talking to you last night. You are truly an artist in every sense of the word. Congratulations on your successful evening, right down to your Uber experience. It was a first for both of us. I recently used Uber for the first time and found it very satisfying. These local cab companies are dreadful and don’t deserve your business.